I have to admit that after the last few weeks of the daily grind, which every day consists of getting up, leaving in the dark, commuting in bumper to bumper traffic, a hectic work day, and then more bumper to bumper traffic, I'm rather beat. As a result, blogging has moved farther and farther down my list of daily priorities. Do I work on my blog or take a nap? A nap trumps all! However, a few of the new arrivals I've recently purchased have inspired me to get my act together, create a polished look and take a few (or possibly more than a few) photos for my blog. This most recent skirt from J. Crew is a good example of one of these new arrivals that has inspired me to put together an outfit. While the purple and blue pastel hues of the skirt could easily be construed as being strictly for spring, I'm trying to see if these brighter work tones for fall. Since the weather here is still warm and balmy, dark colors and thick fabrics just seem out of place, despite it being almost November. This wool blazer I donned for the cooler mornings and these photos is the closest I am going to get in terms of dressing for fall at the moment. While my skirt is something new, my purple bag is something old. Purple is my favorite color and a color that can easily transfer from season to season. Below are some of my purple picks for this fall and beyond. Such a lovely look! Love bag number 6! I love that skirt for fall, it has so much life to it! Love the outfit with the blazer for a more tailored look. Another super look, Katie. I love the masculine feel of the striped shirt and blazer with the feminine skirt and pastels colours. And I know how you feel about do I blog or nap, blog or nap? Nap definitely! That skirt is gorgeous. Love this blue monochromatic girly look. The blazer adds polish and makes it work-appropriate too while that stunning necklace ties it all together. Lastly, your lavender purse is divine! Happy November Katie and I hope it gets less busy for you. <3 Ada. I am love these soft shades on you. This outfit is so beautiful. I really like the skirt. Seems really appropriate for the warm weather we have been having! Love! That purse could not go any better with that outfit! I love the look. The dark blazer pulls out the dark in the skirt! Its so hard to dress for the season when the temps don't agree!! 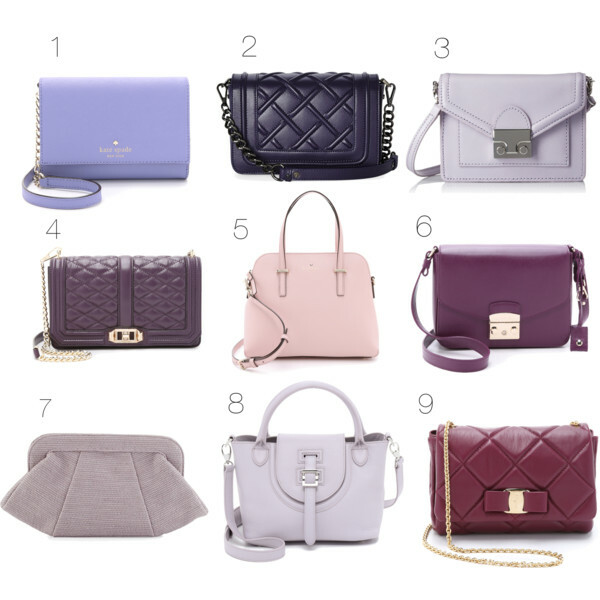 I've never thought about buying a purple toned bag, but #6 in your roundup is just gorgeous. I love the huge gold buckle. Stop by our blog and join our Tuesday Fashion Party Link Up, we'd love to have you. What a gorgeous look, I would be inspired to take photos (as many as I would want) if these arrived as well. I haven't been taking very many outfit shots myself lately, but that is about to change this weekend with some new arrivals as well.